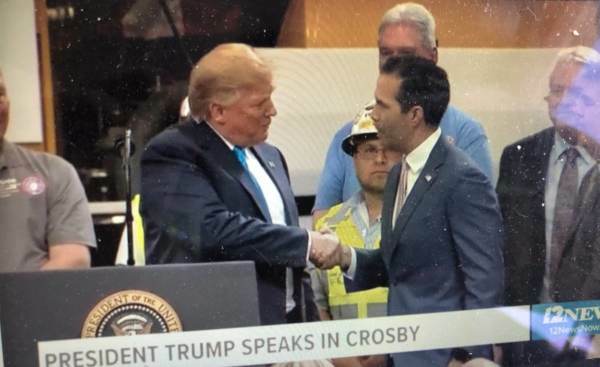 On Wednesday President Trump traveled to Crosby Texas to speak with energy workers. While there he thanked the Texas politicians who came out to see him. George P. Bush happened to be there. And President Trump took notice. President Bush: Thanks also to Texas Land Commissioner George P. Bush for being here. Where’s George. Where’s George? Come here George. This is the only Bush that likes me. This is the only one. Come here! I want to meet you. He’s a friend of my son. And he’s a great guy. And truly this is the Bush that got it right… That’s a great guy. I like him. I like him. He’s going places. It’s well known that both George H. Bush and Barbara Bush did not vote for President Trump. It is also established that George P’s father Jeb Bush is not a fan of President Trump. But President Trump sees potential in the younger Bush! George P seems to be a much better option than low energy Jeb Bush. We’re going to go with President Trump on this one.